You will have to bear with me on this post. 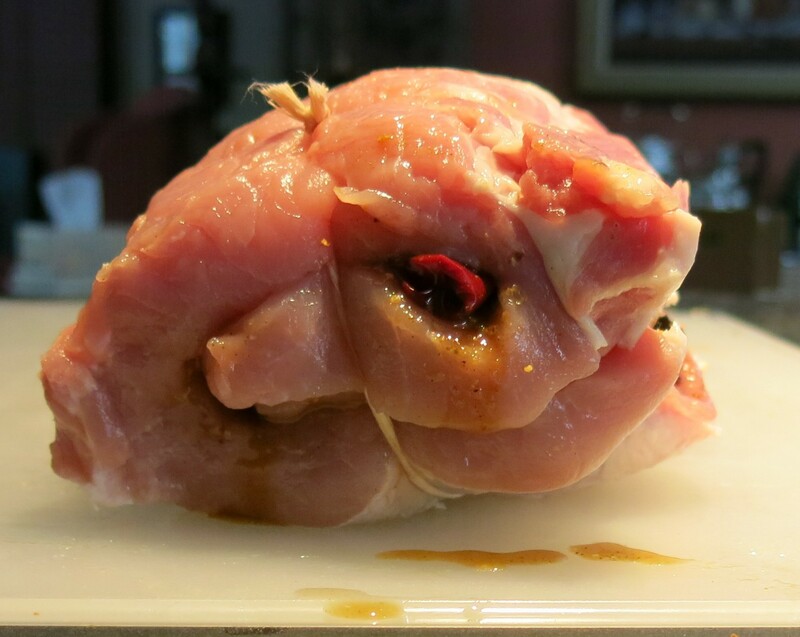 There will a heap of pictures here, as I want you to see how simple it is to butterfly a piece of meat like this. After I butterflied the loin, I seasoned the top of the meat which will be the inside of the roll, spread a mixture of dried fruit, pears, cherries, figs, and apricots which I soaked in tawny Port, added some roasted peppers and a poached leek, then rolled the whole thing up, tied it, and seasoned the outside; it can now be stored overnight in the fridge or roasted immediately, so this is a great party dish.Now a word about pork…pork, in its many iterations, is a very versatile meat. 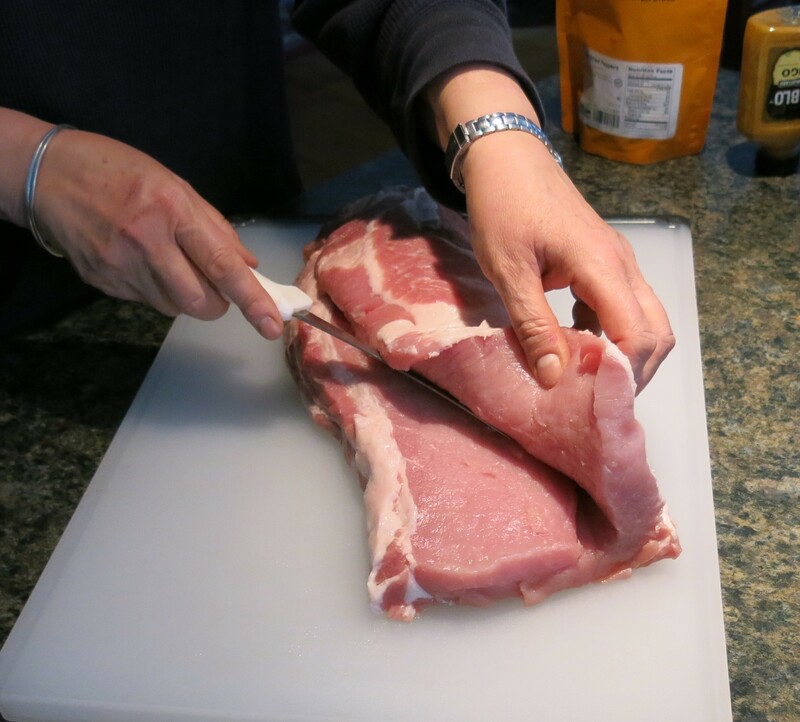 It is generally a lean and tasty option and we could discuss bacon all day; bacon should be a food group unto itself, but that’s another post entirely. 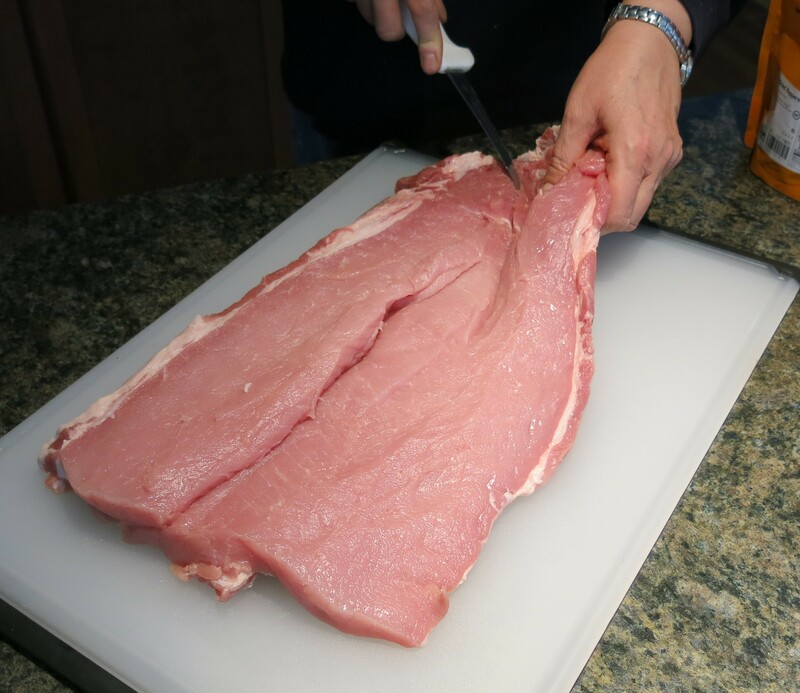 This is a pork loin I’m working with here, but you can stuff a tenderloin, as well as a pork shoulder. 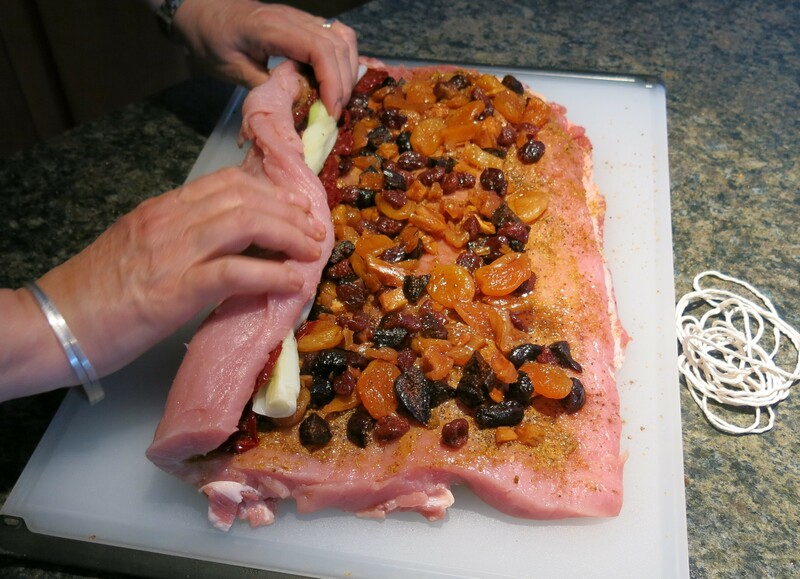 I chose to use Port to soak the fruit in, because pork and Port have a true affinity for each other, but you may use wine, brandy, broth or water. The fruit will need to soak for at least 30 minutes, then when you are ready to use it, simply gently squeeze the liquid out and proceed. The first flap you cut is now on the right side. Again, remember not to cut all the way through the back of the (remember the spine of the book?). 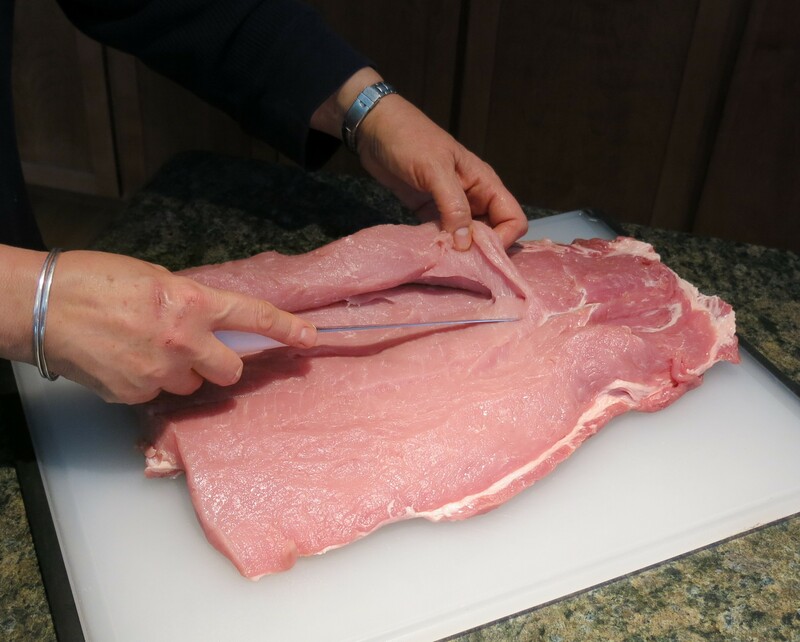 When you’ve finished you will have a rectangular piece of meat of more or less the same thickness and you are now ready to season and stuff the meat! See that wasn’t that complicated. The cutting process probably took me about 5 minutes…really, it goes quickly when you have a sharp knife and a bit of practice. 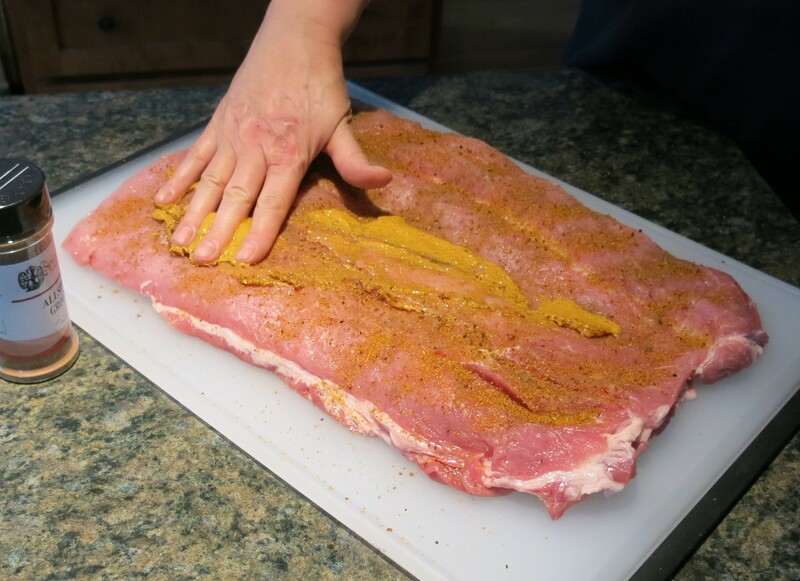 I sprinkle the surface with salt and pepper, and some Cajun seasoning, then smear on some good Dijon mustard and frozen orange juice concentrate. Just coat it evenly and as you can see, hands work very well for this. You want to really rub this mixture into the meat. Now distribute the soaked fruit evenly over the surface. You can stop stick with just the fruit, but I added some roasted peppers and poached leeks at the long side where I will begin rolling the meat, like this. From this angle you can see that the thickness of the rectangle is reasonably even. Now begin rolling. You want to roll relatively tightly. 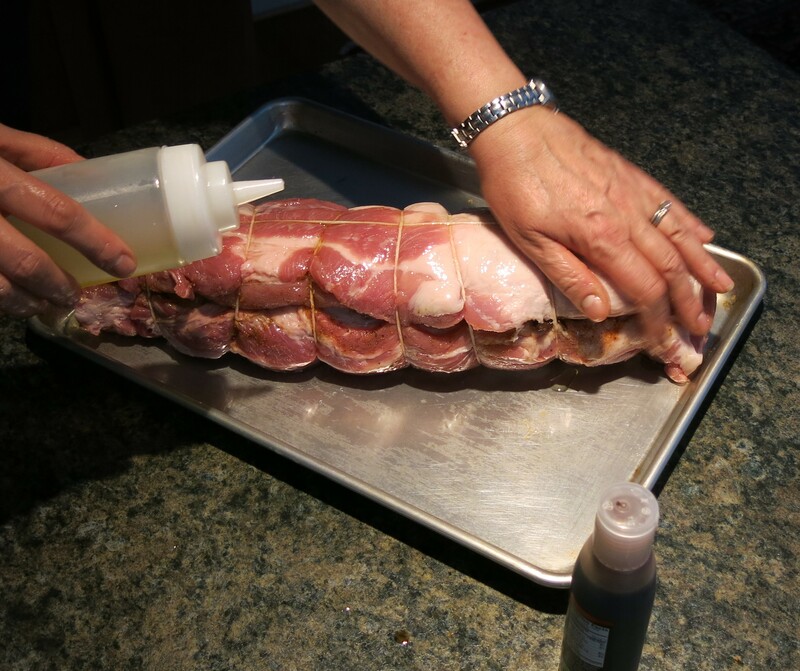 It helps to keep the filling in place, if you gently press down as you roll the meat. If some of the filling falls out, you can just put it back in the ends or sides after you tie it. You’re almost there…goodness awaits you and your hungry guests. Now begin tying the meat. I use cotton kitchen string or twine. It doesn’t slip, so it holds a knot reasonably well. 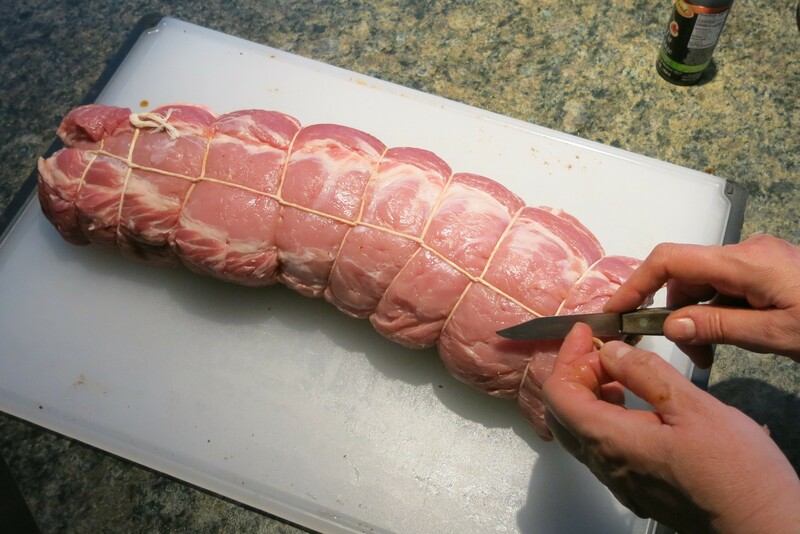 For this piece of meat, cut a piece of the string about 2 yards (or 2 meters) long. 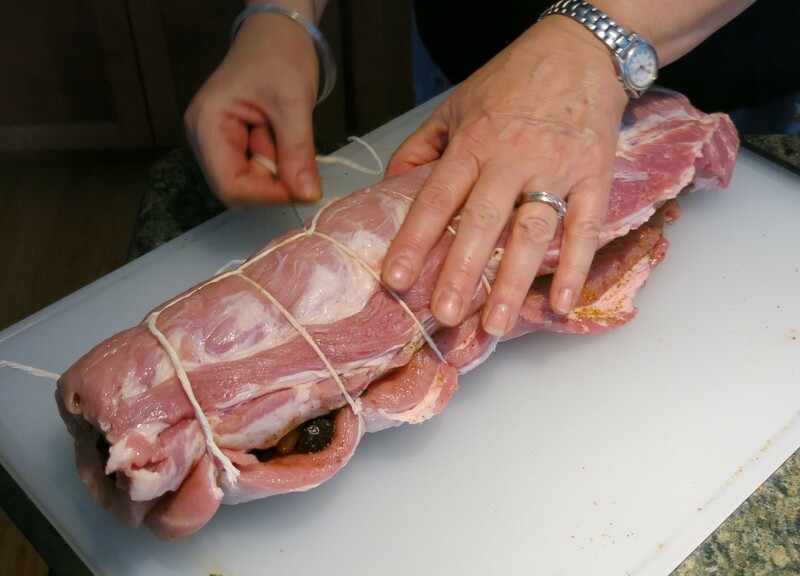 Slide one end of the twine under the meat, about 2 inches from the end farthest from you, bring it up around and firmly tie the first loop. 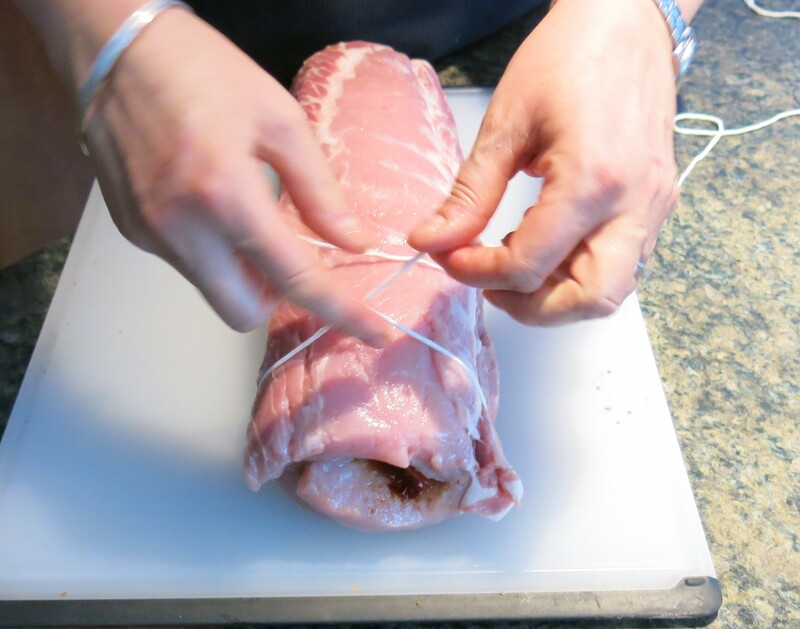 Keep slipping the kitchen twine under the meat, bringing it up and around and tying at about 2 inch intervals until you get to the end. You can see some of the fruit in the cut. Some people sew that opening closed, but I find tying to be easier. Use what method you’re comfortable with. This is what the it will look like when you finish. You can see on the far end (the top left of the photo) there is a large knot. I misjudged the amount of twine I would need so I had to splice another piece of twine in. It happens…. Now you’re ready to season the exterior. I drizzle some olive oil over the whole piece. This help it brown well and acts as a “glue” for the seasoning. I used rosemary, thyme leaves, roasted garlic granules, salt and pepper, and smoked sweet paprika. Okay, it’s ready to either go into the fridge overnight (wrap very well in plastic wrap and return the meat to room temperature before roasting) or pop into a preheated 350F degree oven. 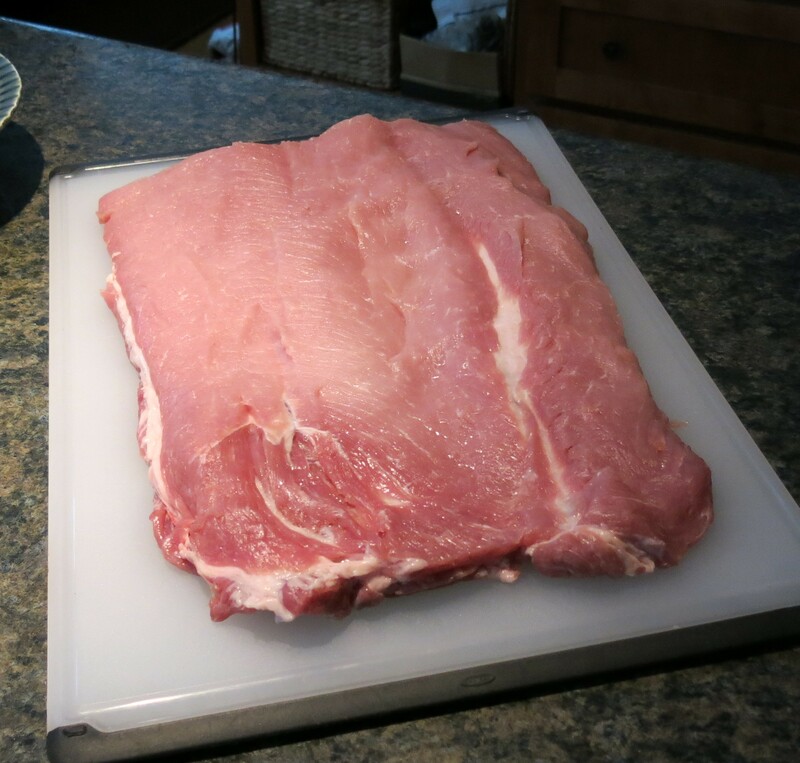 You’re going to roast it for about 20 minutes per pound or to an internal temperature to 155F degrees. When you remove it from the oven, it needs to rest. It’s tired, it’s had a hard day and it was hot in that oven! Seriously, meat meet to always rest for at least 15 minutes. 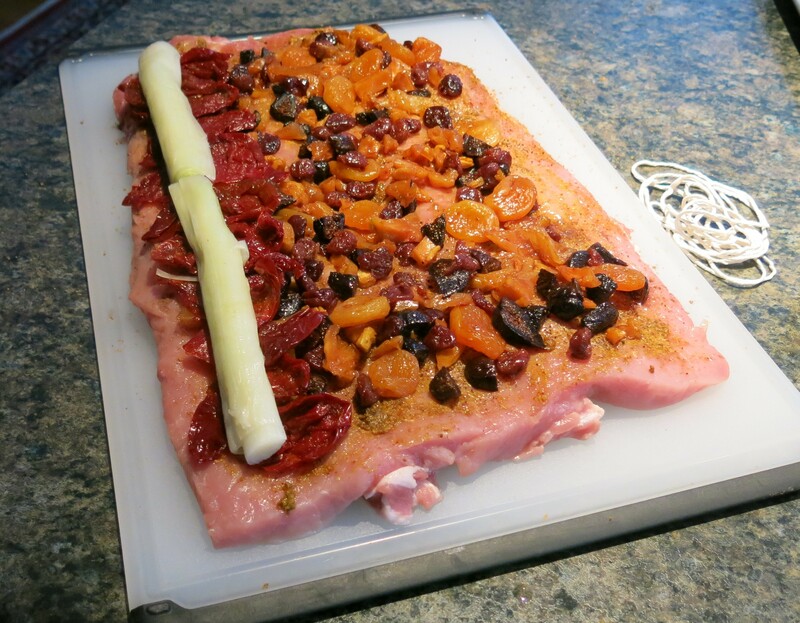 This allows the juices to settle back into the meat and will help keep the meat juicy. Simply tent it with foil; don’t seal the foil tightly. 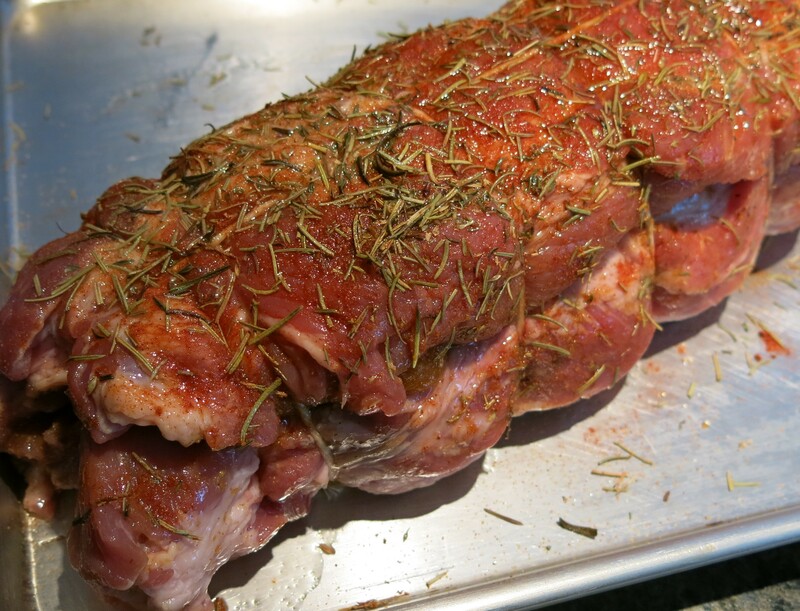 The internal temperature of the meat will raise about 10 degrees during the resting period. You can also make gravy from the drippings, adding the leftover soaking liquid from the dried fruit. Now slice and serve. 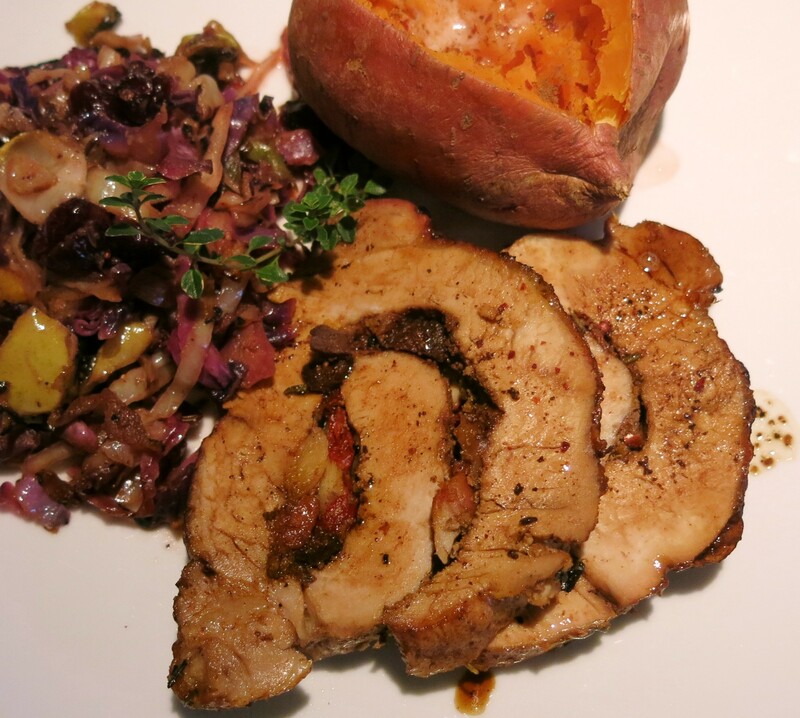 I served this with baked sweet potatoes, and cabbage sautéed with pears, cranberries and scallions which I drizzled with my new obsession, cranberry-pear white balsamic vinegar…it’s orgasmic. Enjoy!